Recorded Live at Madison Square Garden, New York, June 20, 23, 26, 28, 30, 1994. Jay Landers also told the newspaper: “Fortunately, in this particular situation it was sort of a matter of being able to choose—and I don't want to sound too effusive—between great and greater performances of particular songs. We spent a considerable amount of time listening and relistening to all the shows recorded. 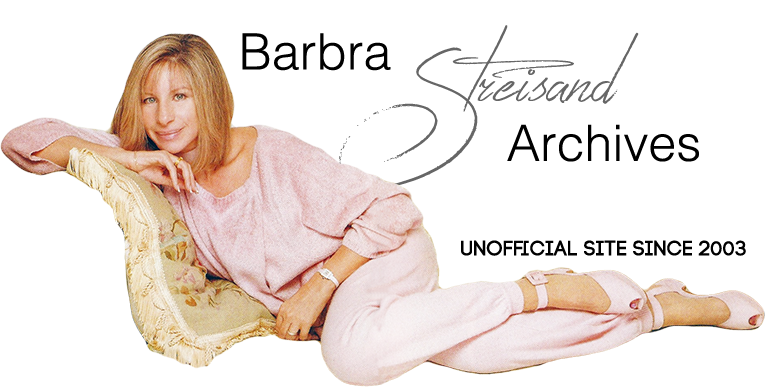 Barbra: The Concert —Streisand's fourth live album—was a nicely packaged, 2-CD set from Columbia Records. It contained an attractive, fold-out insert with photos, concert credits, reviews, and liner notes. Had you attempted to place a long-distance call to New York on Sunday, March 27, 1994, you likely would have heard an irritating “all circuits are busy” message. On that day, across the U.S., more than six million people flooded the phone lines desperately seeking 250,000 tickets to the concert tour of the century. After twenty-seven years, Barbra Streisand was heading back out on the road. In every city she played, including London, Detroit, San Jose, Anaheim, Las Vegas, and Washington, D.C., Barbra was received like a conquering heroine. Her hometown of New York was no exception. Anticipation of her six-night engagement at Madison Square Garden galvanized the city. New York was in a state of terminal buzz over its best-loved favorite daughter. Everyone wanted to be at the Garden. It was a special time in the history of the city. All the pre-concert excitement served as but a citywide warm-up act for the main event. Weaving together many of the best-loved songs spanning Barbra's thirty-year career, treasures from the American popular songbook, and intimate glimpses into Barbra's personal life and times, the Concert was a revelation, a celebration, a consummate moment for a truly great artist. How did this all come together after so long an absence? When Barbra earned the Lifetime Achievement award from N.A.R.A.S. on Grammy night two years ago she teasingly alluded to a possible return to the concert stage. She began to seriously consider performing again, but wanted to create something more substantial than a mere showcase of greatest hits. The challenge was to develop a show that would reﬂect the values, musical influences, personal disappointments and triumphs that shaped her as an artist, as a woman, as a citizen, as a human being. Consulting with friends Marvin Hamlisch and Alan & Marilyn Bergman, Barbra combed through her entire musical catalog, choosing songs that not only served as career milestones, but also held the most meaning to her personally. Two New Year’s concerts in Las Vegas were supposed to be opening and closing night. Yet, despite her stage fright, Barbra was gratiﬁed by the experience, and decided to extend the engagement for a limited tour. Whether or not Barbra ever undertakes such an endeavor again, there can be no doubt that the luckiest people in the world — those who got to see her live on stage — will be talking about the Concert for years to come. This album was recorded at Madison Square Garden. * What you hear is the complete concert. No additional recording was done and the music on this album is entirely live, just pure Barbra. Being an accomplished actress and director, Barbra naturally fashioned her Concert to be a night of musical theater, dividing the evening into two Acts. As such, a lavish visual component played a key role. Each arena was converted to a cozy salon, the stage appointed with American furniture influenced by Barbra's keen interest in Jeffersonian architecture and design. Accompanying Barbra is a brilliant 64-piece orchestra conducted by award-winning composer Marvin Hamlisch. As Act I‘s Overture begins, the energy in the Garden is palpable. Passing through the curtains, standing on the balustrade, and dressed in an elegant gown which she designed to go with the set, Barbra begins Andrew Lloyd Webber's “As If We Never Said Goodbye,” from Sunset Boulevard. With lyrics newly rewritten by Don Black to address the occasion at hand, the song begins, “l don't know why I'm frightened,” and crescendos into a triumphant declaration: “I've come home at last.” Indeed! Long one of the most ardent champions of composer Stephen Sondheim, Barbra settles into “I'm Still Here,” from Follies. Sondheim himself reworked his lyrics, making the song a droll commentary on the ups and downs an artist faces over the long haul. This segues into “Everybody Says Don’t,” from Sondheim’s Anyone Can Whistle, a deﬁant answer to the naysayers of this world. The medley kicks into overdrive with one of Barbra's signature tunes, “Don’t Rain On My Parade,” from Funny Girl. She continues her salute to the Broadway musical, paying homage to Jerome Kern with a lush and languid performance of “Can’t Help Lovin' That Man” from the pioneering musical Showboat. In her introduction to “I’ll Know" from Frank Loesser's Guys & Dolls, Barbra recalls the time when, as a young girl, she entered a Brooklyn movie theater to see the film version of the show. On the giant jumbotron screen overhead, old black & white photos of Barbra ﬂash by as we imagine the dreams and fantasies she might have pondered then. Suddenly, Marlon Brando, in a scene from Guys & Dolls appears on screen, singing “I’ll Know.” Across time, Barbra joins Brando in an emotional duet, as he sings to the thirteen-year-old Streisand whose image is superimposed on screen. Just as Brando reaches to embrace Barbra, the illusion shatters, and Jean Simmons takes her rightful place in his arms. We can feel her adolescent heartbreak. Much was made of the many celebrities who came to see Barbra on the tour, but it’s a sweet moment indeed when Barbra introduces Jule Styne, the legendary composer of her immortal signature song, "People," as meaningful today as when she ﬁrst sang it in Funny Girl in 1964. Barbra now launches into a fascinating interior monologue, a play-within-a-play, about the slow blossoming of a young girl's journey from tentative youth to full-fledged woman. Here Barbra’s theatricality shines forth. She begins with a silky rendition of “Lover Man (Oh Where Can You Be),” which speaks of the yearning for love. Then, lying upon an analyst's couch, she confers with a venerable Viennese shrink (voice off-stage), who attempts to steer his patient towards her feelings. “Will He Like Me?” from She Loves Me addresses the delicious anxieties of teenage years. Then, it’s on to a new therapist’s office for another reality check. Barbra speaks of a special young man she meets one summer. “He Touched Me” from Drat! The Cat! captures the cascading emotions of sexual awakening. Romance comes to fruition as we hear next Barbra's Oscar-winning “Evergreen,” one of the most delicately expressive love songs ever written. Back on the couch (again!! ), Barbra is asked by her next therapist to bare her soul even more, but by now wonders aloud whether she’s the doctor or the patient. On screen, we see a masterful montage assembled from three Streisand films, The Prince Of Tides, Nuts, and On Clear Day You Can See Forever. Barbra’s characters play both therapist and patient in a hilariously neurotic dialogue. Unrequited love is explored in “The Man That Got Away,” from the 1954 version of A Star Is Born, written by Ira Gershwin and Harold Arlen and made famous by Judy Garland. With Liza Minnelli present in the audience, Barbra dedicates the song to Garland. Act I concludes with “On A Clear Day (You Can See Forever),” recast as a new declaration of independence. During the last refrain, Barbra appears for the first time live on the giant overhead screen. The audience is on its feet as the ﬁnal held note soars to the upper rafters of the Garden. Act ll begins with an Entr'acte, accompanied by screen footage from Yentl, Funny Girl, and The Way We Were. As images of Omar Sharif, Robert Redford, and Barbra take us back, the familiar piano motif of “The Way We Were” brings Barbra back to center stage with one of her most popular songs ever. A few fans hold up a homemade banner which catches her attention. The show's emphasis has now shifted. The past is behind us and we now bask in the present. The big screen carries a live shot of Barbra on stage as she segues into “You Don't Bring Me Flowers,” sung dramatically as a solo. Then the stage is bathed in gentle rainbow hues as she performs “Lazy Afternoon” from the Broadway show The Golden Apple. From there, Barbra recalls her ﬁrst encounter with Prince Charles on the set of What's Up, Doc?, twenty years ago. With accompanying newsreel footage on the big screen, she describes her own version of Royal High Tea, much to the audience’s delight. “Not While l’m Around,” from Sondheim’s Sweeney Todd, is dedicated to Barbra’s son Jason. She gives us a peek into her family photo album, as snapshots of Jason, growing from baby to adult, flash across the big screen. When images from The Prince Of Tides depicting co-star Jason in his football uniform fill the screen, the crowd cheers in recognition. Barbra expresses her social conscience with “Ordinary Miracles,” written for her by Alan & Marilyn Bergman and Marvin Hamlisch, reminding us that from small seeds big trees grow. Yentl marked Barbra Streisand’s directing debut in 1983. A brief passage from “Where ls It Written?” questions the mindset that barred women from equal opportunites, and leads to her retelling the tale. Yentl, a young girl from 19th-century eastern Europe, longs to enter the forbidden world of knowledge, then inhabited only by men. The story continues with the beautiful “Papa, Can You Hear Me?” Then, as she sings “Will Someone Ever Look At Me That Way?” a choreographed montage from Yentl fills the screen, in which Yentl (Streisand), Avigdor (Mandy Patinkin) and Hadass (Amy Irving) exchange stolen glances. Then, on screen Yentl (Barbra) begins the urgent “A Piece Of Sky,” while on stage Barbra joins in a duet with her cinematic self. As Yentl sails for a new world of hopes and dreams, the audience, even after nearly two hours of frenzied cheering, goes wild. The grand dreams of a little girl in a darkened Brooklyn theater have come to pass. Act II concludes with “Happy Days Are Here Again,” the enduring anthem from 1929 (and FDR’s campaign theme) that Barbra long ago made her own. The screen ﬁlls with images right off the front page: the crumbling of the Berlin Wall, the handshake on the White House lawn between Rabin and Arafat, the ascendancy of Nelson Mandela, and other victories of the current administration — all signs that, despite the pressing problems remaining, there are countless reasons to believe in hope and to savor triumphs. The audience demands more. Barbra returns for three encores, beginning with Fanny Brice’s theme song “My Man,” from Funny Girl, then segueing into the well-known farewell standard “For All We Know.” Finally, she returns to the stage for the last time to sing “Somewhere,” from West Side Story, a most fitting swan song. On closing night, with the cheering Garden crowd on its feet, this performance is broadcast live on the gigantic jumbotron screen overlooking Times Square, where tens of thousands of New Yorkers gather to join in the celebration. It was a night New York will never forget. Barbra Streisand is an artist whose broad impact on world culture may never be fully measured. Despite her many accomplishments, she recently deﬁned herself as a “work in progress.” Yet there can be no doubt that to her millions of fans across the globe, Barbra can best be described as the “extraordinary miracle” of our time. — Jay Landers with Dan Pine. July 29, 1994.